One of the things which interest me the most about localised cuisines is the desserts which they have to offer. More often than not, the selection of sweet dishes available at a particular place reflects and mirrors the likes and preferences of the people there. 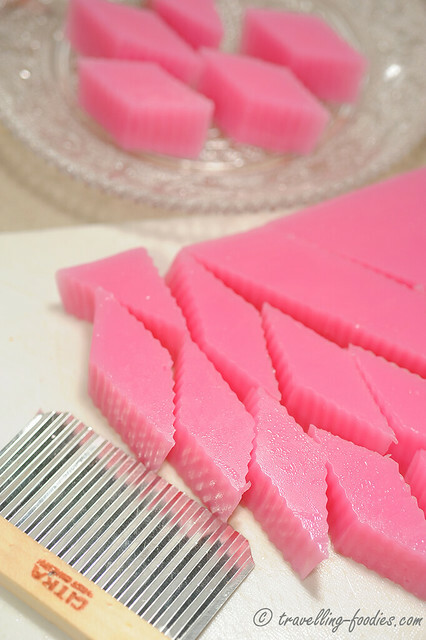 The Japanese are noted for the art of 和菓子 wagashi making, which exudes a transcedental zen-like beauty in form, while in the Canton region of southeastern China as well as Hong Kong, sweet broths with an assortment of ingredients in the form of what the locals call 糖水 tong shuei are enjoyed, not only for their wonderful taste, but also the beneficial effects to health they are supposedly imbued with. In Singapore and Malaysia, desserts take many forms, owing much to the amalgamation of cultures and heritage backgrounds of the various ethnicities living together. Likening a large melting pot, the culinary practices of various races and ethnic groups continually influence each other, creating a wide variety of dishes unique to this region. And Nyonya kuehs must surely be one of the most iconic amidst the vast repertoire of dishes in Straits cuisine. 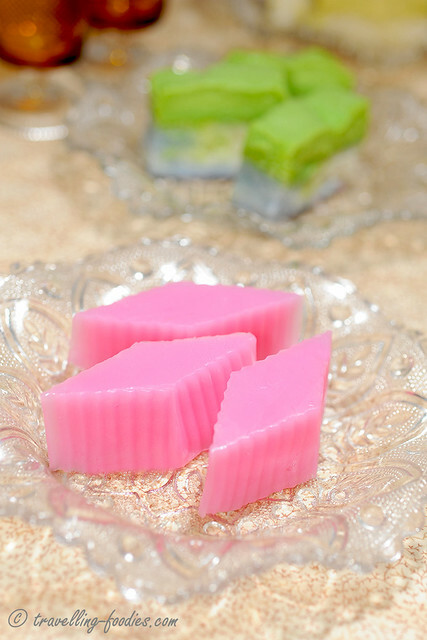 From Kueh Angku to Kueh Lapis, these peranakan sweets which bring together elements from various components like Chinese, Malay and even Thai cooking with an explosion of both colours and flavour. In Penang, apart from the standard spread available also in other parts of the region, one “kueh” variety seems to be found almost uniquely here and despite its simplicity, is much loved by the locals. Hoon Kuih takes on many forms in other parts of the region. Using tepung kacang hijau aka green bean flour as the base, it is known as Nagasari in Indonesia, often made with coconut milk as well as other ingredients like bananas or corn kernels added to them. This is why they are also known as kueh pisang to some communities here. In Penang, Hoon Kuih is often peddled together with an assortment other kuih muihs of both Peranakan and Malay origins. The recipe to make is so simple but yet getting the desired consistency for the heated batter is not an easy feat at all! It must be carefully watched and continually stirred over a low flame. Left too fluid and the kueh will not take form upon cooling but if it is too thick , the kueh would be hard and unpalatable. It takes a bit of practice and observation to get the batter to be of the right level of viscosity and “gooey-ness” to ensure that the final product would be of the right texture. It took me 3 trials to get it right. Let’s see how long it would take you. In a saucepan, add water, pandan leaves and sugar. Bring to a boil and lower flame. Allow to simmer for 5-10 min with lid on. Turn off flame and allow the solution to cool completely. Meanwhile, grease the bottom and sides of the pan with oil and kitchen towel. In a mixing bowl, measure out 5 cups of the sugar solution and mix with green bean flour and with 1-2 drops of pink colouring. Strain the mixture into a saucepan. Cook over medium low flame and stir constantly with a hand whisk. The mixture will thicken and become translucent. Continue stirring until it begins to bubble slightly. Take note to scrape the base of the pan, especially the sides to prevent the batter from overcooking. Remove from flame and pour into the greased tray to cool. Cut when completely cooled and firmed up. NOTE : The key to the recipe is watching the consistency of the batter when it is being heated. For variety, I’d also tried with 4 1/2 cups of water and 1 cup of rose syrup with the sugar reduced to 1/4 cup. It worked very well too! This entry was posted on June 11, 2013 by Alan (travellingfoodies). It was filed under Food, Simple Eats and was tagged with 粉粿, Hoon Kuih, kueh, kuih muih, Nonya, nyonya kueh, Penang, Peranakan, straits chinese, 槟城. Alan, is hoon kueh flour same as those that comes in a tube round form? This is the first time I heard of Hoon Kuih. And oh, using green bean flour. Would love to give this a try one day. same here! It wasn’t till I was doing some reading up and asking around on Penang’s desserts that I got to know about this kueh. Still so many interesting stuff to be discovered and tried! 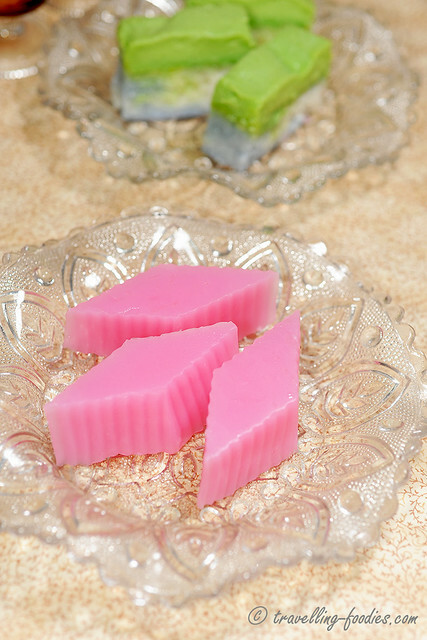 Cantiknya warna Hoon Kuih tu… lembut & rasa romantik pulak! This is one of my favourite kuih, i ate lot of it when i was young. Thanks for sharing this recipe! Alan, do u know what is Hoon Kueh made from? It is yellow medicinal powder that you purchase from medical shop, definetely is not pink in colour? wow! your dogs are very lucky to be able to enjoy such Penang delights! We have the same traditonal food in Java, Indonesia. 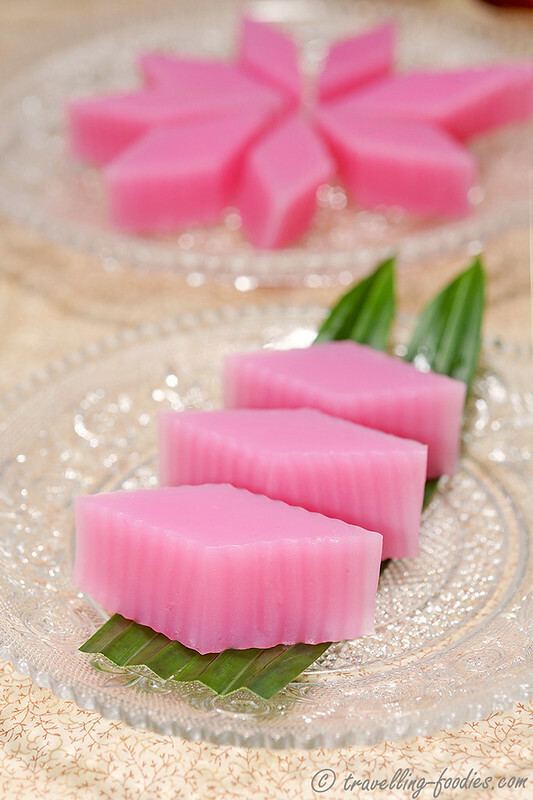 Usually we use Tepung Hung Kwe to make various snack such as pudding, dessert, etc. This post is actually an eye opening for me. I never know that it is actually came from peranakan cuisine. ah I forgot that we also use Tepung Hung kwe to make traditional drink called Cendol. Hi Alan, the ingredients are simple and yet one can still go wrong with the method, is this recipe the same as the one used to sell in Singapore as colourful hoon kueh jelly(cut into diamond shape and quite a generous size)?